Solve your problem with an app! Your handiest gadget when travelling abroad (and life in general) is your smartphone. Because we are thoughtful so-and-sos, we have compiled a list of travel apps that can solve the most common problems while travelling in New Zealand. From getting the most accurate weather forecasts in New Zealand to finding the nearest campsite, these apps for backpackers are the most convenient ways for the tech savvy travellers to prepare. Plus, we know how limited the internet access is in New Zealand, so these apps can work with limited data. Get your smartphone ready now and download these apps, while you still can! Discover things around you with the Breadcrumbs app! Using your location and refining your search with time available, interests and more, Breadcrumbs is a way to discover the hidden gems of New Zealand from travellers and locals with similar tastes to you. In short, it’s the ultimate travel companion for seeing more than the standard tourist sees. Free for all, the Kindle App gives you access to literally millions of books, thousand of audio books, thousand of magazines and much more. No need to have an e-book, just use your phone. This is the single best way to carry an entire library with you aside and save yourself from extra luggage weight. If you fear not to have enough to read, get yourself Kindle Unlimited with your app (30 days free trial) it gives you unlimited access to a massive selection so you can never get bored. Probably the #1 free New Zealand travel app for backpackers is kept up to date by backpackers. It features the locations of public toilets, rubbish bins, campsites, free wifi, supermarkets and much more all over New Zealand. Because New Zealand’s roads are often tricky, a good map is essential when travelling around. Plus, if you are a bit daft, Google Maps can help you find your hostel in case you forget where it is. It happens! Power tip: to save on data, download the map for the next leg of travel in New Zealand when you have WiFi. 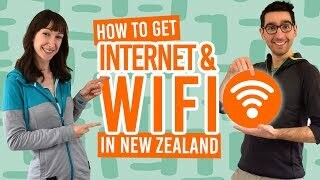 (For tips on finding a decent connection in New Zealand, see here). If English is not your first language, this app will be a lifesaver. Just point at some words and translate it instantly! The two apps are essentially the same. They allow you to call and text people with the same app for free, as long as you have WiFi or data connection. So make sure to get your friends to install the app too. With some of the best night skies in the world, New Zealand is THE place to stargaze. Seriously, just take a look at these stargazing locations. Use Star Chart to know what planet or star you are looking at. Created by 100% Pure New Zealand, this app helps you plan your trip around the country and is illustrated by stunning pictures. New Zealand is known to have four seasons in a day! Be prepared with a good rain jacket and New Zealand’s most accurate weather app. For all the campers out there who cannot be bothered planning their itinerary. Use this map to find the location of the nearest Department of Conservation-run campsite. Be social, by being glued to your phone. Don’t forget to install Foursquare, Facebook, Twitter, Instagram, Pinterest, Google+ and other apps that you prefer to stay in touch and share your travels with friends and family. By the way, like us on Facebook and follow us on Twitter too. Sort out your financial affairs online to make sure you are not going over your backpacking budget. By the way, if you haven’t got a New Zealand bank account yet, check out this article to see how to set a bank account up. Like we’ve said, the internet connection isn’t always great in New Zealand. With Pocket you can save web pages straight from our browser to read them offline.